22 Bible books alphabetical. Here is another printable puzzle about the Bible. Suitable for students in late elementary grades 4,5,6, and homeschoolers. Use this puzzle as an introduction to a unit on Bible books, or as an 'activating prior knowledge' activity for students. 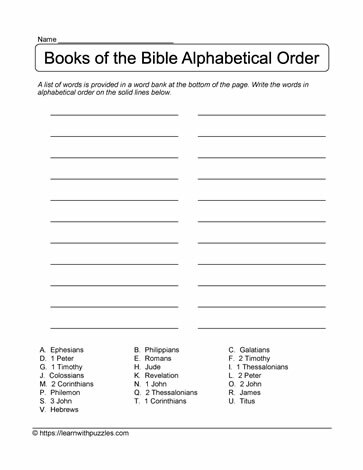 Great for helping students understand alphabetical order and add to their knowledge about the names of books of the bible. Can be used in the homsechooling environment, regular classrooms and church Sunday schools. Engage problem solving and vocabulary building skills with this free, downloadable printable puzzle.